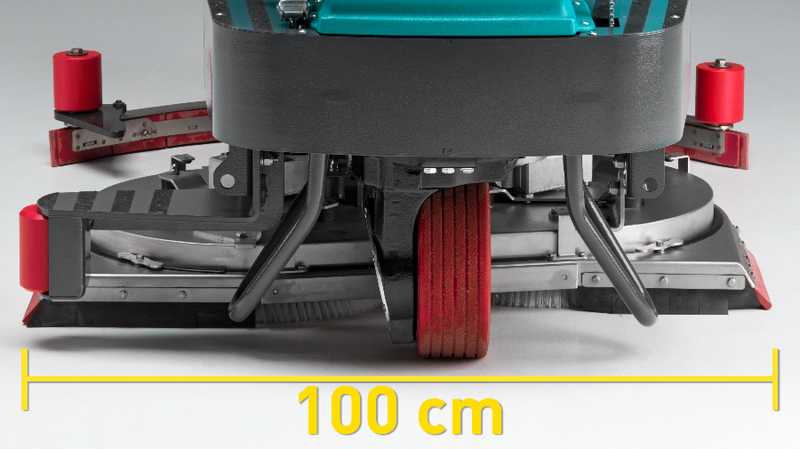 Not just productive and reliable but with its compact design the E100 is also agile and maneuverable. A concentration of technology means the new E100 doesn’t require big dimensions to guarantee impressive results. The machine’s compact body is agile and maneuverable and enhances performance by adding versatility and ease of use to a machine with a one-meter cleaning path. Ideal ratio between brush size and rpm. DOSE-MATIC®: adjust in real time the proportion of detergent and water depending on the conditions of the floor. Effective cleaning also depends on the quantity of water used. Our patented ECOsystem® is a recycling system that recovers and regenerates the cleaning detergent used during scrubbing. This provides the freedom to use all the water necessary, without the hassle of constantly having to stop and refill the solution tank.